New Year’s resolutions may be months away, but when it comes to defining the things that make you happiest in life, there’s no time like the present. I’ve found that it’s a good exercise for me to regularly revisit and revise my priorities and goals. Think about it. We don’t achieve our dreams if we don’t first identify them. With that in mind, I was recently considering what’s most important in my life today. Where do I want to improve? What things do I want to create for myself? What new hobbies do I want to cultivate? As I looked at my list of top-four priorities for the year, I realized that it looked almost identical to the things I’ve focused on in years past: family, friends, work, physical health. I’m not saying these things aren’t important, but a question came to me – am I missing other important opportunities for growth and happiness because I’m focusing too much on the big picture? Let me explain. Family, friends, my career, and my health will always be important to me. They are lifetime goals that I will always strive to nurture and improve upon. But with these evergreens at the top of my list, maybe I was missing the opportunity to identify even more things in life that would make me happy. I realized that if I wanted insight into all the positive changes I can make in my life, I needed to take work and relationships off the list. Plain and simple. It’s not that these things would become less important to me – they are the most important to me. And simply writing these items down wasn’t really instructive for how I could strengthen my relationships, improve my work, or the take the steps that may lead to a happier, more useful life. To get my priorities straight, I changed perspective. So, I created a new list, with no relationships or work-related items allowed. For me, this was a game changer in how I view my goals. While my first list was accurate, the second list I created took more authentic reflection. What I found was that these new goals are genuine for me. It was a spring cleaning of sorts. My new list reminded me that I can focus on work, family and friends, and not forget about the other things that I really love, like travel, getting outdoors, and helping others. It makes sense and it reminded me of “core pursuits.” In my book, “You Can Retire Sooner Than You Think,” I explain the statistically significant data that measure how active retirees keep themselves happy. In two words, it’s core pursuits (or hobbies on steroids, if you will). 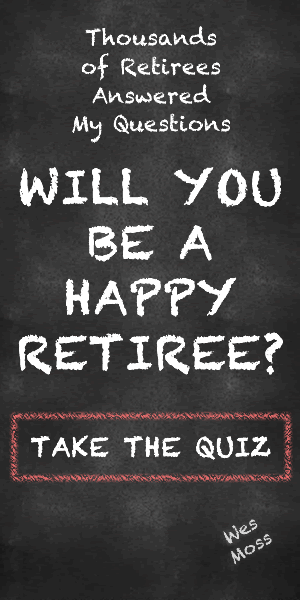 Unhappy retirees have 1.9 core pursuits on average, while the happy camp reports 3.6. The lesson I learned – in our lives, we have room to grow in many areas, and it’s important to focus on all the things that make us happy. Sure, big picture things like career and relationships will always be important, but so are other personal things like hobbies and interests. And we can do both. For starters, it’s worth making a list to remind ourselves of the “smaller picture” things we enjoy. From there, if we align our daily actions with our goals, we will explore more of our potential and be happier for it.